Review posted October 24, 2017. 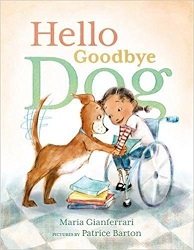 Hello Goodbye Dog is about Zara's dog Moose, who loves Hellos and hates Goodbyes. Moose escapes more than once. Each time, Zara is able to get him calm and quiet by reading aloud to him. But then, he inevitably hears "Goodbye" and puts on the brakes. Each time, it takes progressively more people to get Moose to leave. After an eventful day, where Moose finishes up by playing tag in the cafeteria when he hears the dreaded "Goodbye," Zara has an idea. This is where the book won me over completely - Zara brings Moose to therapy dog school! There's an author's note at the end about therapy dogs and read-to-the-dog programs. But besides being good advertising for read-to-the-dog programs, this book tells a lovely story. The art shows Moose being so friendly and eager all along. There's a progression and a lilt to the story, which will help beginning readers. I love that Zara's in a wheelchair, and this isn't commented on except to note that Moose is extra good with wheelchairs.